“I enlisted out of high school in the US Air Force, Sept. 13, 1955, during the Korean War. Went to tech school after basic and became an Aircraft & Engine Mech. Graduated, 3rd in my class. Was deployed to Bitburg, Germany and assigned to an off base missile/launcher crew. I had married just prior to assignment to Germany. Served here for almost 3 years before being called and reassigned stateside to be closer to my Mother & Father who was dying of cancer. (I was an only child). My Dad got to meet his first Grandchild before being called Home. At the end of my tour, I received an honorable discharge. I got a job at a nearby National Guard Base and was trained on an F100C fighter jet. Upon completion of my training, I was asked by the Department of the US Air Force if I’d re-enlist for special duty related to end of the war cleanup in Korean. My family had grown to include 3 young boys by now; my wife at the time and I talked the matter over knowing it would mean possible deployment. We decided I would sigh up and come to the aid of my country once again. I experienced several deployments over the next almost 10 years at which point I needed to reunite with my family and was again Honorably Discharged as a Staff a Sargent in July of 1965. I’m currently 2 months shy of turning 81 years of age, retired and living off my Social Security. I had remarried when my wife of 38 years was called Home about 5 years ago after a 2 1/2 year battle with cancer. Most of my time now is given to helping others with cancer and other issues. I cook meals, drive them to doctor appointments, shopping, church, pray for them and try to serve their needs in any way I can. For the past 1 1/2 years, I’ve been recovering from throat cancer myself and recently pronounced cured. I’m getting back in the grove of helping others along with my new wife. Over the past few months, I’ve had issues with my current A/C system. It’s over 21 years old, costing me dearly in power usage and I’ve had to have it serviced with Freon @ $90.00 a pound over the past 6 months. I’m told it’s beyond repair and needs to be replaced. I’m between a rock and hard spot because I can’t afford a new unit although the temps right now, today and for the rest of this week, are going to be in the 102’s & 103’s. Between doctor bills and everyday basic needs, I frequently have to steal from some bills to pay others. To be drawn as a winner of a new A/C system would be a blessing beyond belief and not soon forgotten!! Of course, the team at NexGen couldn’t read the story of a man like Al without reaching out to help him. In June of 2017, Al was named as our Military Appreciation Program Recipient for a brand new, fully-installed Trane unit. 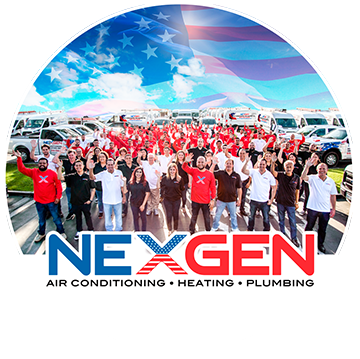 Here at NexGen, we are profoundly grateful for the service of our military personnel and their families. We are even more grateful to have the opportunity to give back and support our community. It is the least we can do to honor and serve those who help keep our country free! If you or someone you know should be considered for our MAP program, please visit Project X for more information and nominations!